A cheerful vibe envelopes you as you enter the Greek cuisine restaurant Greco replete with pristine white and bright blue decor – quintessentially Greek. Although located at Radisson Blu Resort, Cavelossim in South Goa, the separate entrance with the menu placed outside, gives you an option to enter this place, without having to go through the Hotel. The striking decor actually transports you to Greece and you could well be in a taverna with a relaxed setting. An arch way leads you to the outdoor seating which is of the inimitable courtyard style and offers a spectacular view. Of course, there is ample seating inside too. In fact the plush interiors, with a swish, well-stocked bar and the mood lighting creates an unparalleled atmosphere. A simple but complete menu largely representative of Crete island in Greece, is palced before you. However, there are other specialities from other parts of Greece too, giving a diner an insight into this cuisine. The menu has been cleverly crafted by Chef Stelios, a native of Greece. Sea food expectedly abounds in the offerings. My Psarosopa is a medley of sea food flavours- subtle and comforting. The sea food stock has been cleverly used and is not overpowering. The Greek Mezze here is quite different from the various versions that are often passed off as the original mezze. The tzatziki is bang on in flavours and textures. The kalamata olive paste wows my palate as well, but it is the aubergine salad which unexpectedly stands out. With the warm pita bread dipped into these in turns, I relish every morsel I eat. The garides saganaki- a simple but flavourful prawns dish in tomatoes with a dash of ouzo (liqueur) perks up my taste buds. The prawns are fresh and of a superior quality. The tragani feta bursting with fresh flavours, encased in a crisp covering drizzled with honey, with a characteristic sweet and savoury flavour, was the piece de resistance for the evening. It clearly bore testimony to the chef’s mastery over his craft. The gyros chicken is well-made too. Sea food and poultry apart, for hard-core carnivores, there is a fair amount to choose from. Vegetarians need not despair as there is ample variety too. My dessert is special, yet, traditional. Galaktoboureko – a sweet and sour cream on a pastry crust immersed me in a food coma. A bite into the crispy phyllo and the creamy semoilna custard filled one’s mouth. Made to perfection, it was a dessert which left you satiated and yet, craving for more. I observed that nowhere in my entire meal, did the spices (although minimal) drown the flavours of the core ingredients and the chef had donejustice to all the ingredients by using simple cooking methods. The use of extra virgin olive oil, ouzo and fresh authentic ingredients adds the right amount of punch and flavour to the dishes. The food is high on flavours and the quality of the ingredients, shines through. It is simple and uncomplicated fare. If a cocktail is what you fancy, the bartender behind the glitzy bar will make you something to your taste. And of course the selection of wines will lure you as well. The staff is well-informed about the menu and the service is quick and alert. Greco truly surpassed my expectations and I felt that for the first time in India, I had a Greek meal which was an honest representation of this simple but flavoursome cuisine. Vietnamese cuisine is fairly new to India and still relatively lesser known, but fast gaining popularity. Five Star Hotels and stand alone specialty Pan Asian restaurants are the only ones who generally serve this cuisine in metros. The Vietnamese pop up at Shiro, in Mumbai, led by Chef Vu Dinh Hung from Ho Chi Minh City seemed like the perfect opportunity to step into the restaurant, after a somewhat long gap. Of course Chef Vu had trained the team here headed by Chef Sameer Juvekar and left. Yet, the entire meal served to us was authenticity personified. This simple but flavourful cuisine, has borrowed a lot from China, Thailand and of course has an obvious French influence too. But all to its advantage. 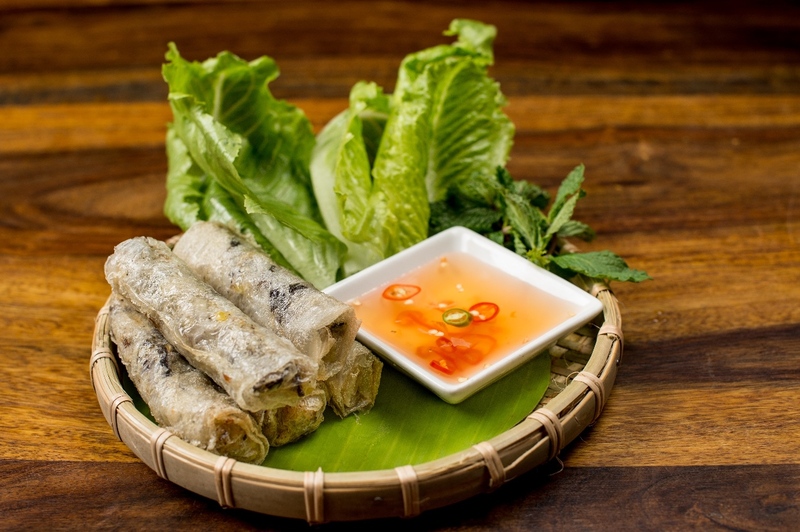 We began our meal with the customary summer salad rolls comprising vegetables, bún (rice vermicelli), & other ingredients wrapped in Vietnamese bánh tráng (rice paper). These truly were a refreshing start as it was light and easy on the stomach. The burst of crunchy veggies in the rolls felt good to bite into. Ours were the prawns and crabstick ones, but Vegetarians have an exciting Tofu option. Cha gio, or the spring rolls with vegetables came next. Unlike the Chinese spring rolls, these are lighter and easier to digest. One has to wrap them in a lettuce leaf and dip into the sauce to relish them in the traditional way. These surpassed our expectations. Absolutely extraordinary flavours and gave a boost to our palate. No Vietnamese meal is complete without Pho and I must confess, I was secretly awaiting its arrival. Pho is a popular noodle soup, made with rice noodle, herbs, broth and chicken. It is filling, yet, not a complete meal. In fact it is quite light and refreshing. The dash of chilies and the paste added the right amount of zing to it and perked our taste buds beyond compare. Olive oil, lots of tomatoes, Italian basil, pistachios, all have a large presence in Hung’s dishes, we discovered. Along with these, he mixes Western foods with Asian ingredients in his signature dishes to give them a contemporary twist. I loved that as he obviously does a perfect job of it. The BBQ eggplant took us completely by surprise. I was reluctant to try it but with its unique marinade and copious amounts of peanuts and grilled to perfection, it turned out to be one of my favourites that evening. As in our baigan bharta, the eggplant flavour was masked, and yet distinctly enhanced. 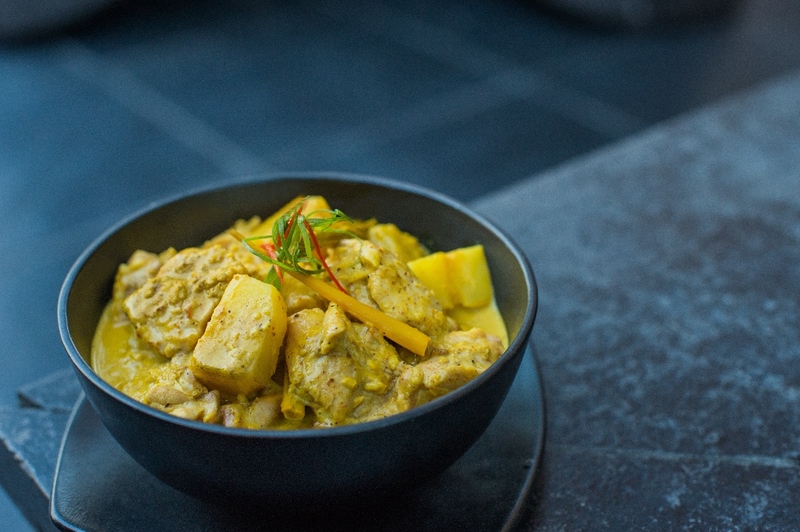 A mildly flavoured aromatic chicken and potato curry with steamed sticky rice followed. It was strongly reminiscent of the Thai curry minus the galangal and lemon grass of course.Vietnamese curries are made with freshly ground spices as opposed to pastes. Totally my comfort food. Relished it. Could have been a bit more spicy though. Although each dish we were served, was savoured by us, but they had saved the best for the last. The glass noodles had an eclectic flavour. The myriad textures- crunchy, creamy, teased our palates and made us crave for more. It was a compete meal in itself, although Chef Juvekar, generously sent us some clay pot fish which had subtle saucy flavours and was equally delicious. The chef’s creativity knows no bounds. The chocolate fondant with figs ( my first ever) was delightful and decadent. What a fabulous combination I thought, it was. The cream and crunch were married perfectly. 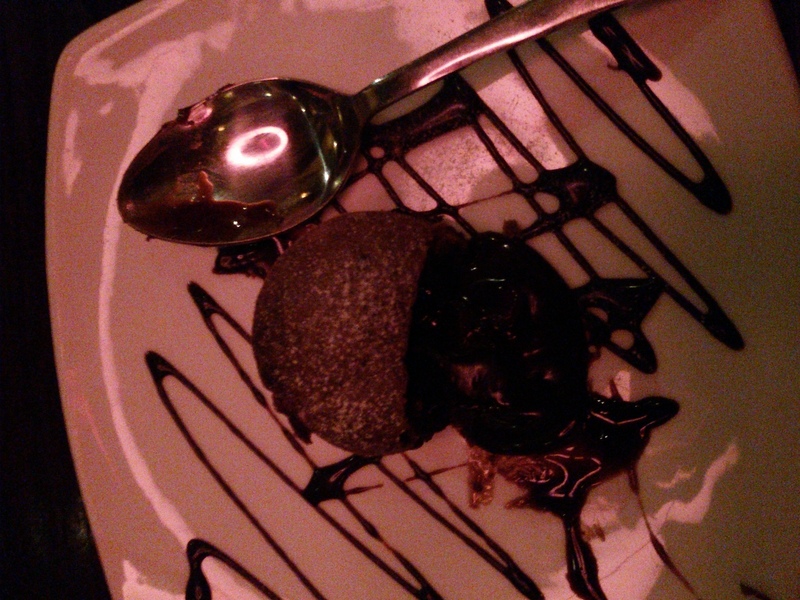 The molten chocolate filled our mouth and we were satiated beyond words. Oriental food is always a lure for me as I relish that immensely. Naturally then, lunch at Emperor, the swank, new fine dining restaurant at Deltin Daman, seemed like an appealing idea. I was in for a surprise. The décor is understated and elegant and yet has the richness, befitting an Emperor. An interesting amalgamation of textures created as a result of the clever use of flooring, lighting and colours makes this restaurant chic and attractive. The food at Emperor is undoubtedly a feast for all the senses. 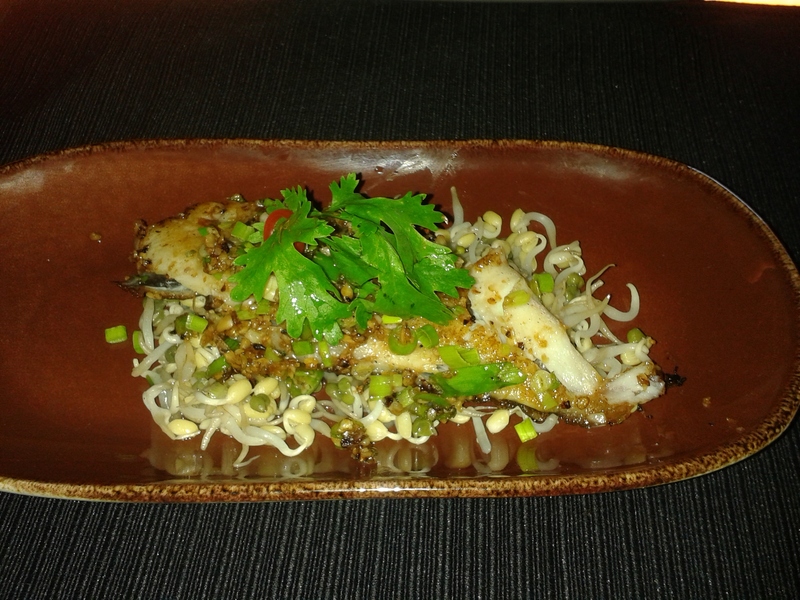 Pomfret garlic spring onion, on a bed of bean sprouts, was as aromatic as it was visually appealing. A bite into it and there was a burst of flavours in my mouth. Subtle, yet flavoursome. The pomfret and spring onions juxtaposed unusual textures. Crispy calamari, another starter, was fried to perfection and the calamari was soft, not chewy, as they sometimes turn. The chicken ginseng soup was heart-warming with strong flavours. The corn, spinach and water chestnut dumpling stole my heart with its soft, yet crunchy texture and delicious flavours. Chicken Char su pao dumpling was as authentic as it can get. The presentation of each dish caught my eye. Chef Love Mathur, is not only a chef extraordinaire, but also has an eye for details. His presentation is virtually poetry on plate. A man of few words, Chef Mathur lets his food speak for him. And trust me. that does say volumes about his expertise and versatility. In the main course, the Jasmine chicken fried rice with its aromatic, mild flavours and prawns schezwan style were the highlight. The wok tossed beans, although a simple dish, were a real surprise and tantalised my taste buds. Chef Mathur obviously believes in less is more, and lets the flavours of the ingredient be predominant and does not let spices and seasonings overpower it. Even the cooking methods used are gentle and do justice to the ingredients. The litchi toffee in the desserts, disappointed me a wee bit as the juicy flavour of the litchi was lost on the caramalised toffee. The steamed lotus bun with Mango Tropicana added the wow factor to the entire meal and was the perfect way to end our meal. It was an unusual pairing I thought and yet one, which complimented each other. Impeccable service, palate pleasing food and elegant décor, makes Emperor an outstanding place to dine. Easily, one of the best Oriental meals I have had across the country. A feast truly for kings! Umame has somehow always intrigued me and I have been waiting for an opportunity to sample the Pan Asian cuisine here. What better time than the week-long Times City Gourmet Week I thought, so I hopped along for a lunch. Umame’ which means the fifth flavour, a savoury taste derived from glutamates, is an apt name for this restaurant. As the name suggests, this flavour is different from the other four well-known flavours of sweet-sour-hot and salty, Umame the restaurant too, is distinct. The spacious seating struck me as soon as we entered. The dark wood floorings, textured charcoal-coloured ceiling and a gleaming black marble bar are majestic and appealing. The Al-fresco area that overlooks the Oval Maidan is the highlight. The set menu for the week is by no means limited. It offers something for every palate. The Chicken Tinola soup which I tried was soothing. 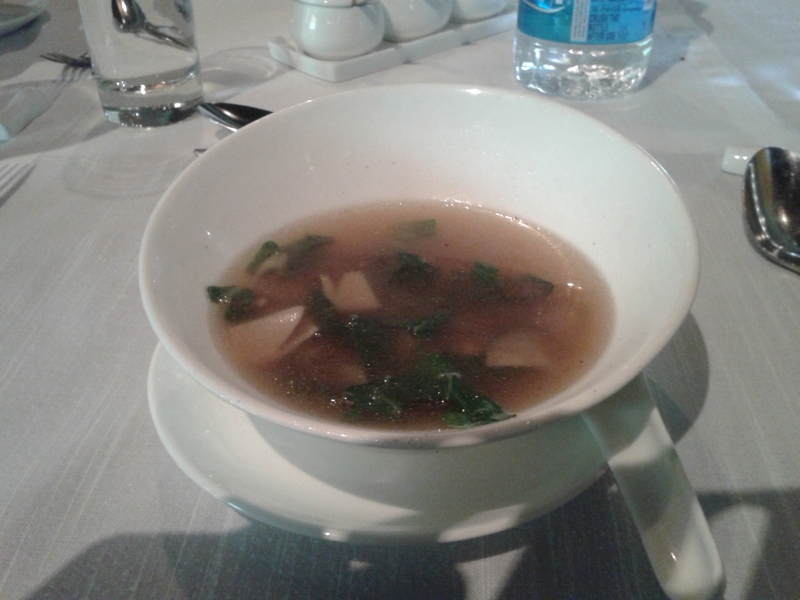 A clear soup, its subtle flavours teased my taste buds and the succulent pieces of chicken were delicious. 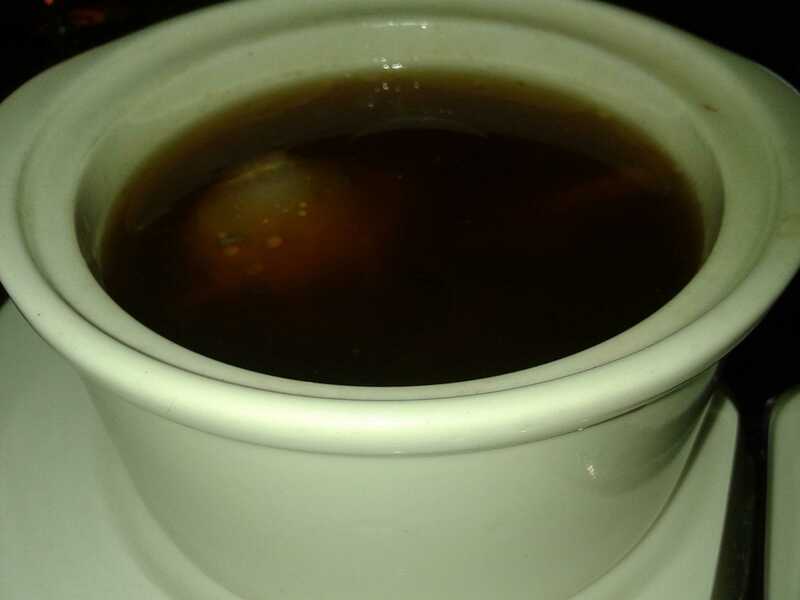 My friend’s Vietnamese Tamarind soup of tender chicken was equally a surprise. It was not too spicy like normal hot n sour soups, and yet, replete with flavours. Vegetarians may opt for Roasted Pepper and tomato cappuccino or a Tom yum with tofu and straw mushrooms. Quite innovative I thought. My pepper crusted Alaskan cod with balsamic teriyaki glaze, served on a bed of sticky rice and greens was an absolute treat. 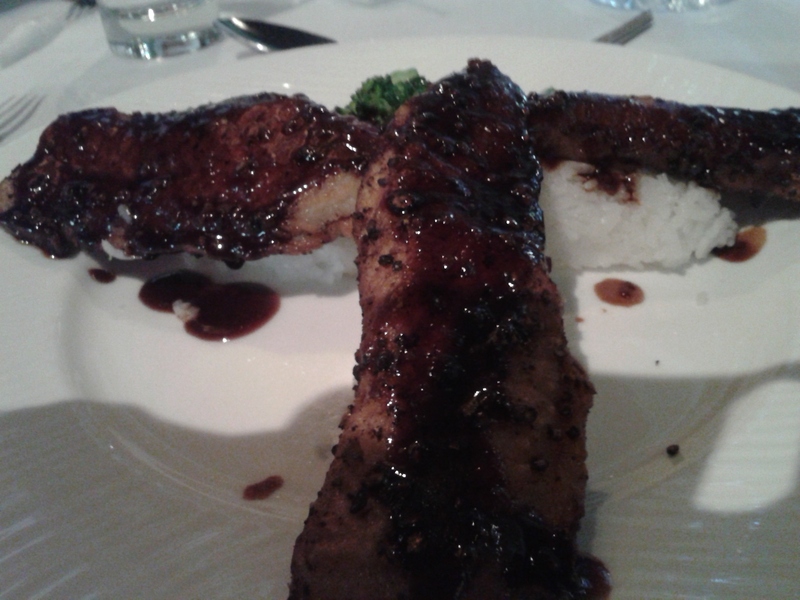 Grilled to perfection, the teriyaki flavour complimented the cod and the bland sticky rice paired extremely well with it. The flavours exploded in my mouth, yet, were not overpowering. The Thai style barbecued chicken which my friend selected, was served with steamed rice. It had the right amount of Thai flavours and was delightful, but not extraordinary. Vegetarians need not despair. Thai Green palace curry, Cottage cheese and water chestnuts steaks in Korean sesame sauce sound equally exotic. What do I say about the dessert- My sweet mistake? It is pure indulgence and the best I have sampled in a long time. That is a mistake I’d love to repeat. Chocolatey with a soft, creamy texture, it simply melt in my mouth. and the presentation too was outstanding. For lunch, there are no appetizers, but for dinner, you have a vast array to choose from. Chicken sui mai, Dumpling of prawn n chive, barbecued cottage cheese and many more. At Rs 1000 plus taxes for lunch per head and Rs 1200 plus taxes for dinner, dining at Umame is a steal. Undoubtedly, value-for-money. The team of Chefs, Dilshad and Farrokh Khambata can take a bow. Umame is a great fine dining place sans any pretense. The service however is a bit slow and the staff, a trifle confused. Overall, a memorable dining experience. Be sure to go there this week, if you have not already and for regulars, once is not enough! It was my second visit to Casa Sarita and I was really looking forward to the Goan meal akin to the one we cook at home. Chicken Xacuti, Prawn curry, Pork Vindaloo, red rice et al. But I was in for a pleasant surprise. Chef Vaz had beautifully amalgamated authentic flavours with minimalistic presentations and in a way redefined fine-dining. He had created a contemporary menu with time-honoured Goan culinary traditions. We thus embarked upon a new Goan culinary journey. I was a little skeptical and even voiced my fears to the Chef. Would the traditional Goans accept this avant garde treatment to their sacred cuisine? Would foreign tourists really understand what the real Goan cuisine is? With these thoughts in mind, I surrendered to the new culinary experience. Thomas Abraham, General Manager, Park Hyatt Goa, put things in perspective. “Goan cuisine tells a story that is steeped in history. There is tradition and emotion attached to every dish; we didn’t want to take away from that. What we offer our guests is still a medley of the piquant flavours associated with Goan cuisine, yet presented with creativity and innovation.” I bought that. Chef Edridge Vaz’s modern interpretation of traditional dishes left me spellbound. Prawn and coriander soup with black pepper was served so artistically. Made me want to try it more than ever. Quail cafreal with sweet potato bhaji and tamarind glazed shallot. Sounded unique. With trepidation we tried it. It was mind blowing or shall I say palate blowing? Scallop jere mere, mango and chilli sauce, cabbage and coconut salad roll. The surprise element of the meal continued. My favourite fish curry rice too came in a new avatar. Sea bass fillet in acrid lemon berry curry and Goan rice. It was a treat for the eyes first and then all the other senses. All the original flavours and ingredients had been retained. Only its presentation was more attractive now. Crispy pork belly with vindalho jam and rawa sanna, I though was a delightful way to present this good ‘ol dish. But the best was yet to come. The traditional alle belle was deconstructed to an alle belle parfait with semi dried coconut and jaggery sauce. 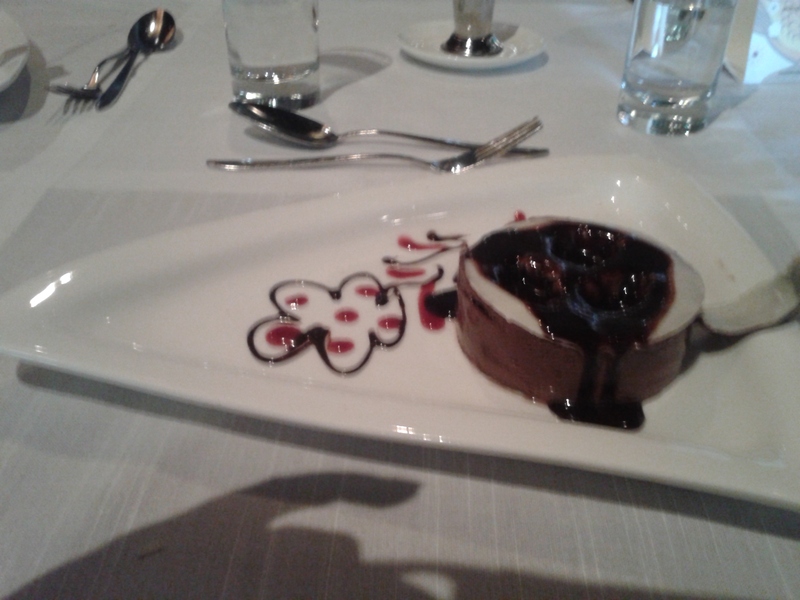 Chef Nelson Fernandes, Pastry Chef, had clearly won my heart as normally I do not even touch Goan desserts. And this one was a treat par excellence – a perfect conclusion to the repast. Casa Sarita is the signature fine-dining restaurant at Park Hyatt Goa Resort and Spa. The restaurant is reminiscent of a bygone era, offering guests an experience that reflects the delicate blend of Indian and Portuguese influences. It has remained true to its promise and yet delivered a meal which has put Goan cuisine on the international map in presentation too. Kudos to Chef Vaz, Chef Tanuja Kerker and their team.